Pianist Pro for the iPad takes the best-known iPhone piano, Pianist, to a whole new level. We've added a great arpeggiator, a drum machine, a choice of instruments, and a completely new interface that makes playing piano scales fun again. With Pianist Pro you need never be without your piano. During the development of Pianist Pro we have produced a number of demonstration videos, from the early days running on the iPad simulator to later additions of MIDI control capabilities. We invite you to sit back and watch the showcase. Pianist Pro offers both single and dual keyboards, zoomable to suit your playing style, and easily navigated using the mini keyboard representation. The dual keyboard is split and each section can be pointed to a separate area of the piano keyboard - perfect for playing left and right hand parts simultaneously. Note velocity is dependent on where you hit the key, with a softer sound further up the screen. A pitch bend / modulation wheel and swell (volume) pedal can be optionally displayed over the keyboard to allow extra emphasis in the recording. Although not common on digital pianos, These controls come into their own for the additional instruments that Pianist Pro has to offer such as organs, guitars and synths. The modulation wheel can even be used to control a low-pass filter for the synth instruments. The 'Scale Piano' allows you to play any scale in any key merely by sliding a finger up and down the screen. Select from a range of preset scales (from standard scales such as Major and Natural Minor, to more specialised scales such as Pentatonic Blues, Persian Gypsy or Chinese), or create your own. You can even change scale and key in the middle of playing a run of notes. At last, playing scales on a piano can be fun! 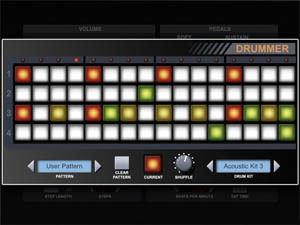 A built-in drum machine offers an elegantly simple interface for adding rhythm, with a choice of drum kits to suit a variety of musical styles. Four drum sounds (kick, snare, open and closed hihats) at three drum intensity levels lets you compose a range of rhythms, and a shuffle control can be used to add a touch of swing. 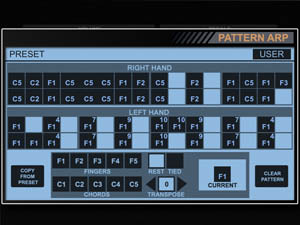 A fully featured arpeggiator allows you to play complex and perfectly timed runs of notes from holding down a few keys. As well as the standard modes (Up, Down, Up/Down, Random), Pianist Pro includes a new mode called the 'Pattern Arp', allowing you to define patterns of notes that turn a simple held chord into a complex musical phrase. Pianist Pro makes it easy to play shuffle-beat blues, complete with walking bassline and overlaid jazz chords - all by holding one single chord. Changing the chord changes the melody but maintains the tight rhythm provided by the arpeggiator. You can use a MFi MIDI keyboard (Line6 MobileKeys shown here) or the Camera Connection Kit together with a compatible USB MIDI interface or keyboard to plug directly into the iPad and access the great sounds and facilities of Pianist Pro with a hardware piano keyboard. Volume, mod, pitch wheel, soft and sustain pedal changes are all sent to the app. 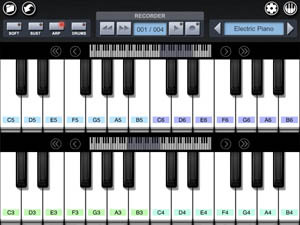 Use Pianist Pro as a MIDI sound source to expand the sounds of your hardware keyboard, or as a simple mobile MIDI recorder. 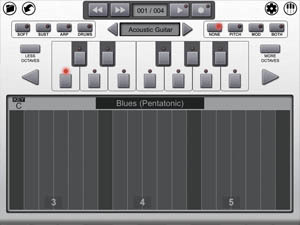 You can even connect it to a PC or Mac and use the Scale Piano to control your Digital Audio Workstation (eg. GarageBand or Logic) soft synths. With Pianist Pro you can control your Digital Audio Workstation and soft and hardware synths wirelessly. MIDI data is sent from the iPad by wi-fi using Network MIDI, OSC or DSMI, which is translated on your PC or Mac into MIDI messages. Note up and down messages are sent, along with volume, modulation and pitch wheel changes which can be routed to any MIDI CC controller. Play your studio soft synths and samplers from the sofa, or even from another room! Pianist Pro starred in Apple's international TV advert entitled "iPad is Musical", where it was shown to play the background music for the ad, and was the only music app featured. It was number one Music App in the UK, USA, Australia, China, and France. It was recommended by Rolling Stone Magazine, New York Times, The Independent, Sound on Sound amongst many others. It was used by pop band Squeeze to perform one of their songs live on Jimmy Fallon on NBC - potentially the first use of an iPad as a music instrument in a prime-time slot.